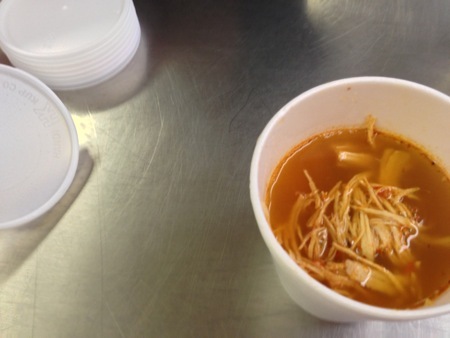 Fatboy Chicken Posole for 100? No problem! Another Second Saturday meal is in the books, and once again soup was on. I did my take on a Chicken Posole, complete with a slow-roasted sofrito and the worst chili burn I have ever had the misfortune of experiencing. Word of advice, if working on seeding dozens of hot chilis, do yourself a favor and wear gloves. We were all out of gloves in my size and I decided it wasn't too big a deal. I speant 6 hours regretting that decision. Once again Shirley, Leo, and Dave were on hand to help with pouring soup for 100 containers, and getting the rest of the meals put together for folks to take with them. My variation on a traditional Mexican soup. Great flavor, and a nice hearty soup.